After OMV’s pipeline project Nabucco failed, the EU Commission takes into consideration a stripped-down version along the Danube. 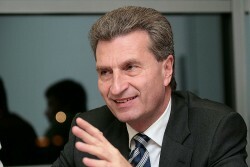 “Perhaps not under the name Nabucco West, perhaps with other investors but the infrastructure alongside the Danube will remain an important project particularly since we expect Romania to become not only a major gas market but also an exporter of gas with offshore gas and shale gas,” EU Commissioner for Energy Günther Oettinger said. This article includes a total of 249 words.